Primarily "Lord of the Mummy Wrapping" Anubis was one of the very old gods. 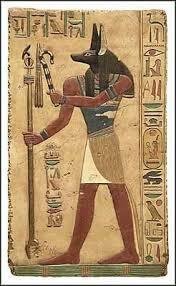 He was depicted in the form of a dog or jackal, either as a man with a jackal head or as the full animal. Most likely jackals were associated with death because they had been observed eating corpses, but Flinders Petrie speculated that the animals assembled in graveyards to feed off the offerings left there to honor the dead. A possible explanation for the cult of Anubis God is that rituals in honor of the jackal were an attempt to put a benevolent interpretation on his practice of digging for bones in graveyards. In other words, if these macabre habits could be enshrined in mythology and religion, perhaps Anubis God would use them for good rather than evil. Hence Anubis God was given an important role in myths, especially in the underworld where he became responsible for caring for the bodies of the recently dead. The earliest myths made Anubis God the son of Ra, but the chief stories of Anubis God gave him an altogether different genealogy, one in which he had a clearly benevolent role. By the time of the Coffin Texts he was involved in the myths of Osiris. He was Nephthys’ son, supposedly by her husband, Seth, but in fact the child of her liaison with Osiris. The mother deserted her son in fear of Seth, but Isis found the child and raised him because he was the son of her now-dead husband. Anubis God became Isis’ faithful watchdog and protector and was rewarded with the ability to understand human speech and to study medicine and the art of embalming. Following Osiris’ death, Anubis God was asked by Ra to assist Isis in reassembling the dismembered body. He and Horus, with Thoth’s advice and magic, were able to wrap the body in mummy’s cloth and restore it to its original shape. When he had finished his work, Anubis God said to his father: “Arise and live: Behold your new appearance. Avert the crime of him who did you wrong.” This act made Anubis God valuable to human beings who hoped that he would do the same for their bodies when the time came. As a result, he was assigned major roles in the afterlife in the Book of the Dead and elsewhere. Known as “Counter of Hearts,” he greeted the dead on their entrance into the underworld and worked along with Horus to embalm the bodies and preserve the mortal remains from decay. Sometimes Anubis God was thought of as the god who led the dead to the presence of Osiris for final judgment, although Horus also en had that assignment. Anubis God was also shown supporting the fright mummy during the episode of the Opening of the Mouth, symbolize the importance of this myth, during the actual embalming of the body a priest wore a jackal mask to indicate that he was Anubis’ representative in this ritual By the Twenty-first Dynasty Anubis God had become a generally popular god. The papyrus of Nisti-Ta-Nebet- Taui called him “Lord of the Holy Land” and claimed that “he gives gifts and food, all good and pure things, all things beautiful and sweet which the heaven gives, which are found on earth, which are brought by the Nile from his cave for Osiris.” Later still, Anubis God remained an important god for the Greeks and Romans and ancient Egypt . Plutarch reported that he was the one who connected the visible with the invisible world.